Asif Mian has been awarded a 2018-2019 Workspace Artist Residency by the Lower Manhattan Cultural Counsel (LMCC). A nine-month studio residency program that focuses on creative practice development for emerging artists working across all disciplines, LMCC’s Workspace program offers space for experimentation and dialogue with peers and arts professionals, as well as career-advancement opportunities. Workspace encourages creative risk-taking, collaboration, learning and skill-sharing at a critical early stage of an artist’s career and serves between 15 and 20 individuals or collaborative groups annually. Topical Cream’s 2018 Benefit Auction includes work donated by Bonnie Lucas and Andrew Ross, among many others. Closes Wednesday, September 19. Preview: Thursday, September 20, 6-9pm. Slated for release at the 2018 New York Art Book Fair, Jasper Johns Vs Brian Ramnarine is a facsimile publication comprised of partially-redacted evidence used by the United States Attorney’s Office to convict Ramnarine of multiple felonies in 2014. Included among the contents - all of which were obtained through a FOIA request - are fabricated correspondence between Ramnarine and Johns, fake letters of authenticity, and images of the artist’s work which Ramnarine forged and attempted to sell. If you’re in Europe this month, visit us at SWAB in Barcelona September 27–30. New works by Emilie Gossiaux and Billy Jacobs. Emergency Contacts is an exhibition based on a collection of written correspondence between two psychoanalysts: Jamieson Webster & Marcus Coelen. "During the past four years and over the course of my many moves around New York and New Haven, I’ve found myself scouring local dollar stores in search of affordable fragments of home. The nostalgia of printed plastics that permeated the landscape my intercultural childhood and continue to pervade the needs of my daily living. My identification with and dependency on these materials are inextricably linked to my memories of growing up in a working class home, while at a larger environmental scale, threaten the very water and land upon which my life depends. Living in midst of this cultural and environmental contradiction, my collage practice has become a ceremony of reconfiguration and critical reflection on the themes of diaspora, domesticity and disposability. In this regard, I think about volumes as both an accumulation of disparate and layered narratives, both personal and collective, and the way in which these narratives materially amount to mass." "Volume is integral to sculpture and installation: it is based in the amount of space a substance or object occupies. However, in many ways I wanted to create the opposite—an ethereal volume—one that is transient and slippery. The live camera creates this virtual volume as an unseen and ghostly substance." "Apple Hires Creator of Virtual Reality Cyber Paint App"
"In light of her debut solo show, the artist discusses returning to painting and drawing since losing her vision; learning to understand the world through touch, and rendering figurative imagery from dreams and memories." "You may have heard the saying, 'beauty is in the eyes of the beholder.' But in some cases - it may be in the hands of the holder. One example is the New York Metropolitan Museum of Art, which offers free, special tours for the blind or the partially sighted. They include both guided touch tours and verbal imaging tours. Elena Wolf spoke with one of the museum's guides, Emilie Gossiaux, an artist, who also happens to be blind. Anna Rice narrates her report." We're excited to see what comes next. Sterling Crispin's N.A.N.O. , B.I.O. , I.N.F.O. , C.O.G.N.O. included in Refuge. "Contemplating how we will pursue a better life in the mid-21st century, Sterling Crispin combines references to ancient symbols and new technology in his survivalist sculptures, N.A.N.O. , B.I.O. , I.N.F.O. , C.O.G.N.O. The works are named after Nanotechnology, Biotechnology, Information Technology, and Cognitive Science, four industries which the artist says “promise to revolutionize the world as society approaches the technological singularity, a predicted event near the year 2045 in which the rate of technological growth becomes infinite. Each sculpture is meant to be a poetic and evocative embodiment of these four industries as deities or totemic spirits, but also a market embodiment as each sculpture contains a certificate for 100 shares of stock in a real company doing transformative research in these industries. There’s also a use-value vs. market-value conversation in the work with the water filter that can provide clean drinking water for a family of four for two years.” These works were inspired by the artist’s observations of the dichotomies between expanding technological progress and the environmental extremes of frequent fires, draughts, and earthquakes in California. Under these conditions, many people would become environmental refugees; in such a scenario, Crispin’s totems may offer both relief and belief in the possibility of survival." Presented by the New Art Dealers Alliance (NADA), Close Quarters, featuring eight NADA Member galleries, is NADA’s first non-art fair exhibition hosted on Governors Island. Open July 1–29, contemporary artwork will be displayed across two floors of a historic turn-of-the-century Colonial Revival house on Governors Island, and will be on view every weekend in July, Friday through Sunday, 11am–5pm. There will be a special opening preview held on Thursday, June 28th from 1–5pm. Previously occupied by the Coast Guard, House 403 has a storied history on Governors Island, serving as the site of many of President Ronald Reagan’s meetings with world leaders, including Soviet President Mikhail Gorbachev. The house is located within the Governors Island Historic District, designated by the New York City Landmarks and Preservation Commission. Five paintings by Billy Jacobs feature in the Evergreen Review's latest issue alongside an excerpt from Antoine Volodine's novel Lisbon, Last Frontier. The Evergreen Review offers new writing and art from the cutting edges of culture, identity, and politics. Inspired in part by Henry David Thoreau's blistering essay, "In Defense of John Brown," which is exactly as inflammatory as the title suggests, the current issue includes a span of work, both fiction and non-, that rejects accommodation and passive resistance to right-wing tyranny with impassioned, uncompromising political stances that land on the intersection of individual freedom and collective action. More from the Evergreen Review can be found here. 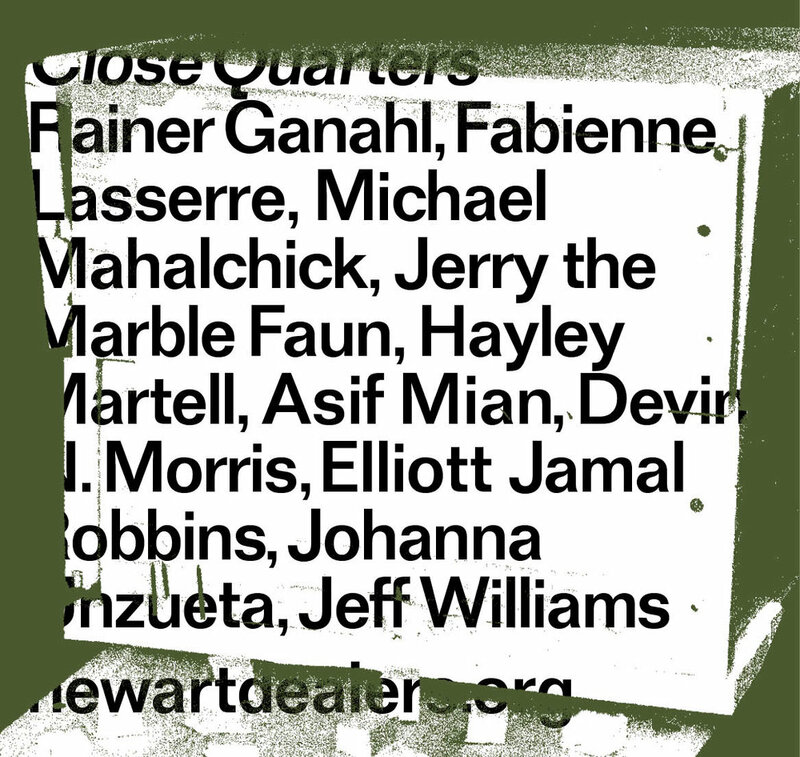 Asif Mian will be featured in 'Close Quarters' on Governor's Island this July, NADA's first off-site exhibition. Emilie Gossiaux has been awarded the drawing residency at Dumfries House. Artists’ residencies at Dumfries House are open to artists for whom drawing is part of their practice. The residencies are delivered by the Royal Drawing School, Glasgow School of Art and Dumfries House.